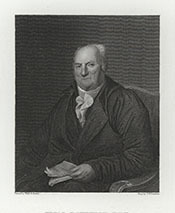 BOUDINOT, Elias, a Delegate and a Representative from New Jersey; born in Philadelphia, Pa., May 2, 1740; received a classical education; studied law; was admitted to the bar in 1760 and commenced practice in Elizabethtown, N.J.; member of the board of trustees of Princeton College 1772-1821; member of the committee of safety in 1775; commissary general of prisoners in the Revolutionary Army 1776-1779; Member of the Continental Congress in 1778, 1781, 1782 and 1783, serving as President in 1782 and 1783, and signing the treaty of peace with England; resumed the practice of law; elected as a Pro-Administration candidate to the First, Second, and Third Congresses (March 4, 1789-March 3, 1795); was not a candidate for renomination in 1794 to the Fourth Congress; Director of the Mint from October 1795 to July 1805, when he resigned; elected first president of the American Bible Society, in 1816; died in Burlington, Burlington County, N.J., October 24, 1821; interment in St. Mary's Protestant Episcopal Church Cemetery. Boyd, George Adams. Elias Boudinot: Patriot and Statesman, 1740-1821. 1952. Reprint, Westwood, Conn.: Greenwood Publishing Group, 1969.